Stilt Acrobats perform highly skilled stunts, backward walkovers, handstands and high dance lifts during their walkabout routines. Trained to use the potentials of their environment, our performers explore the urban surroundings and create a performance to suit. 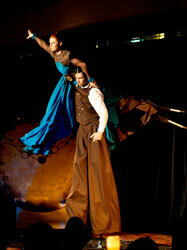 We also offer a rare treat of aerial stilt arts in our latest show Elixia. Have one of the acrobatic stilt characters from Elixia join you at your event. Email us to find out what is most suitable for your environment. See photos from the Elixia show premier at the Hue Festival in Vietnam 2010. Allow our clockwork stilt acrobats to take you back in time on a journey of cogs and steam powered entertainment. Duet dances, acrobatic stilt movement or fully choreographed shows. 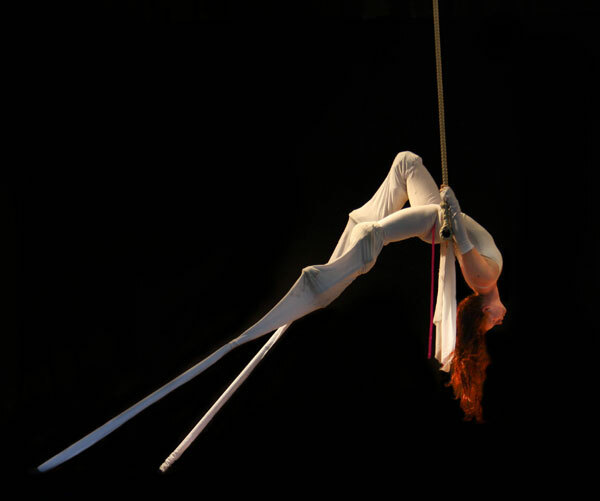 A single-point trapeze or silk can be rigged at many venues, offering the possibility of short aerial stilt sets. Min 5m ceiling height required for trapeze and 9m ceiling height for all other aerials.